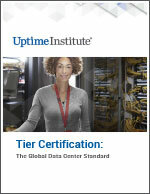 Abstract - Uptime Institute Tier Certification is unique in the industry in its rigor and comprehensiveness, differing from a number of other compliance assessments that rely on a sampling or representative analysis. Tier Certification provides an analysis of each and every system down to the level of valve positions and panel feeds. Tier Certification specifically applies to—and recognizes—functionality and capacity that is demonstrated on the design documents for Tier Certification of Design Documents, and infrastructure that is installed/implemented during the site visit for Tier Certification of Constructed Facility. Operational Sustainability Certification is the final phase, to identify the behaviors and risks beyond design and construction that impact the ability of a data center to perform over the long term. Operational Sustainability Certification recognizes operational excellence and mitigation of operator errors—the leading cause of data center outages.